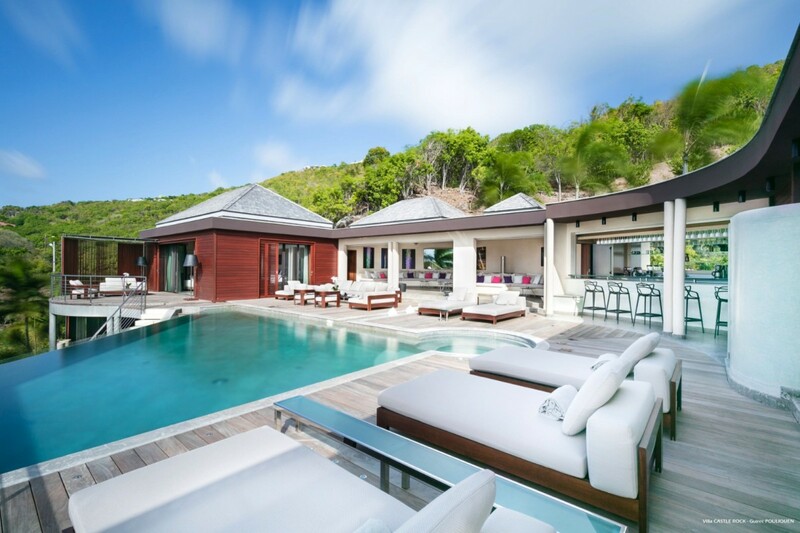 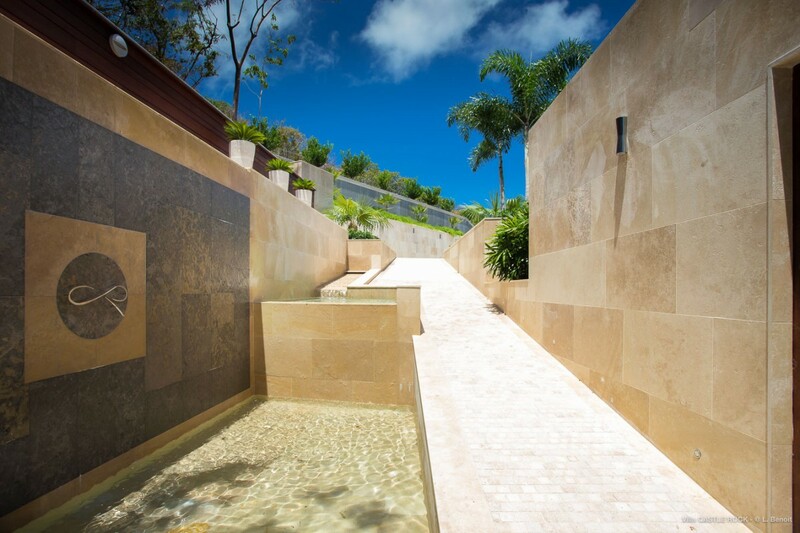 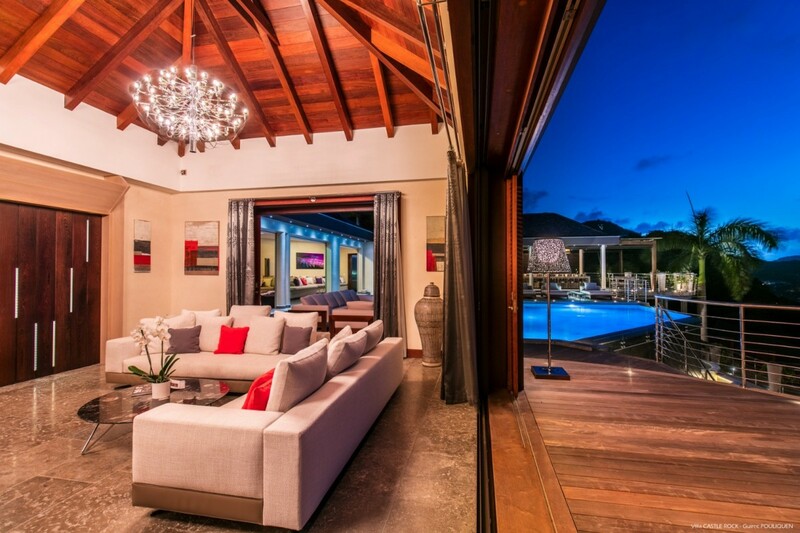 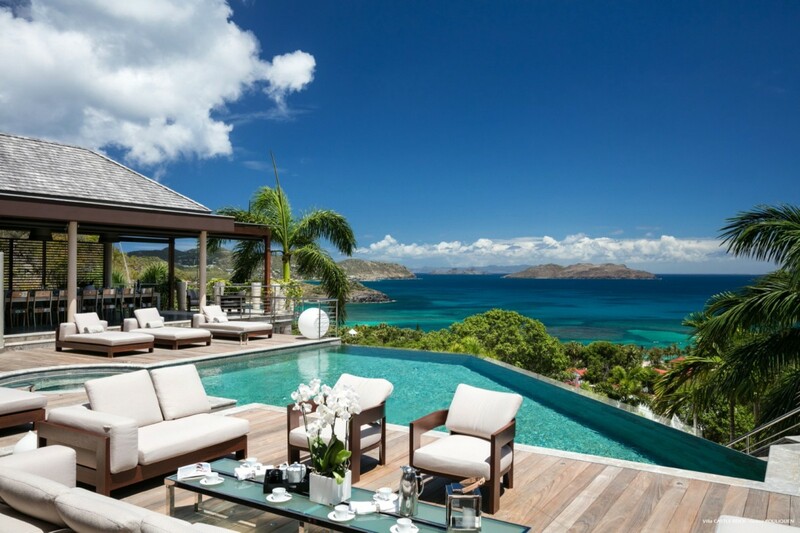 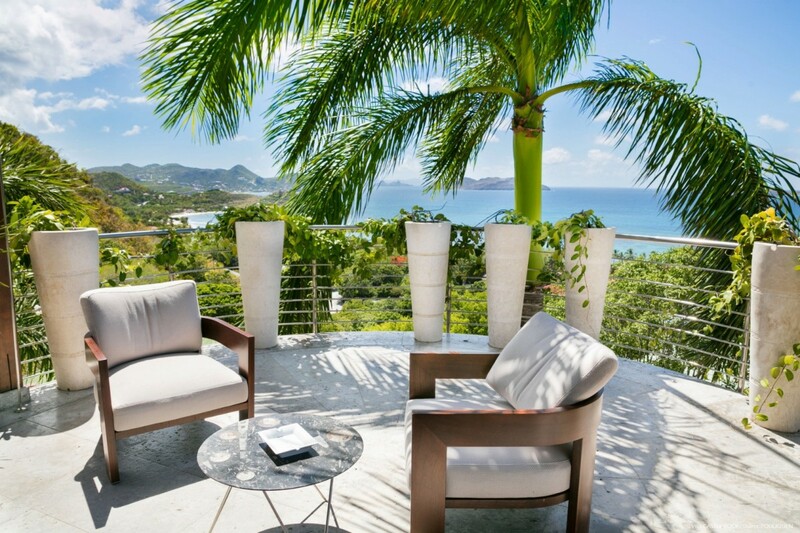 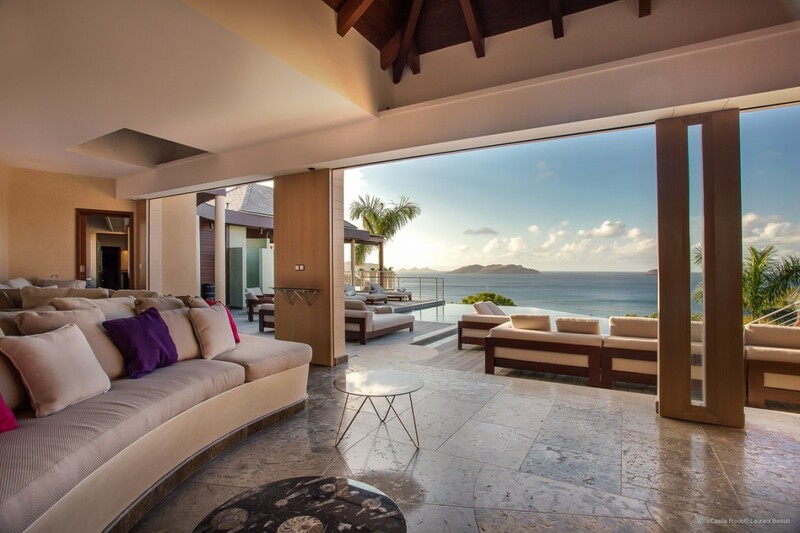 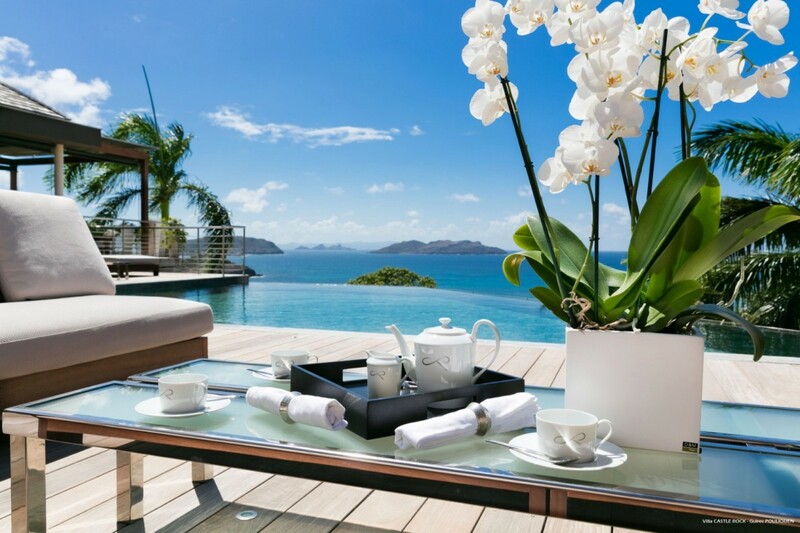 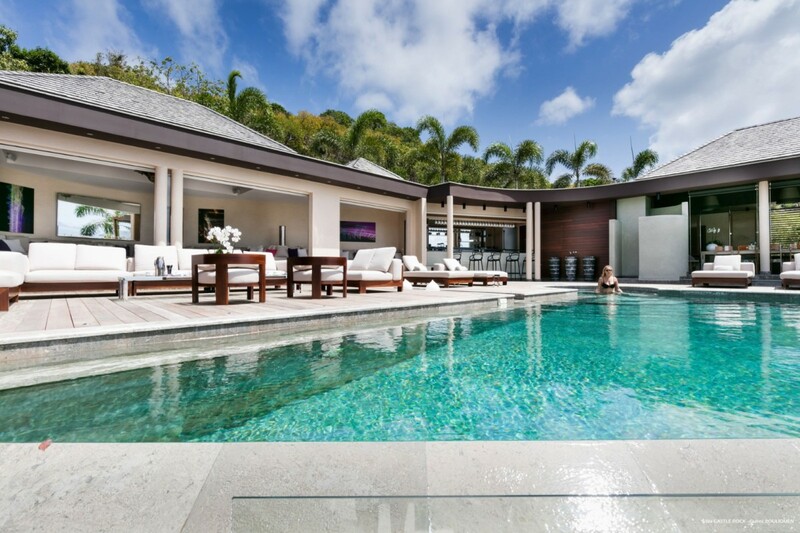 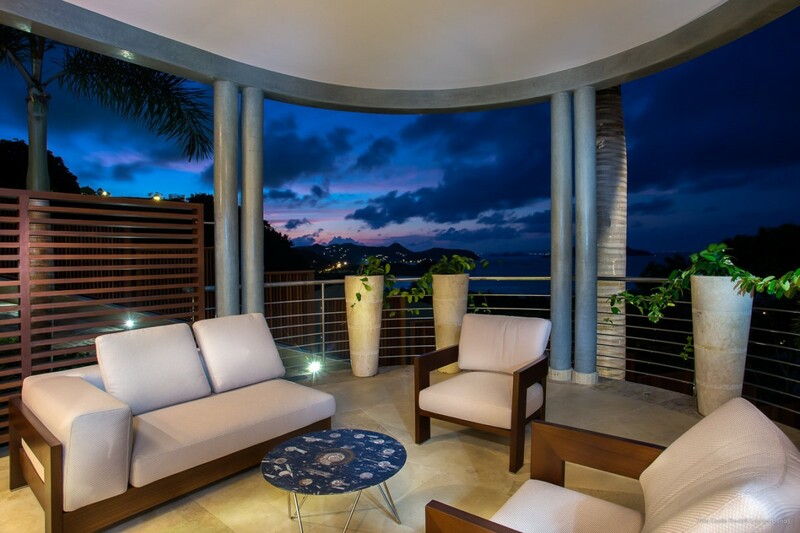 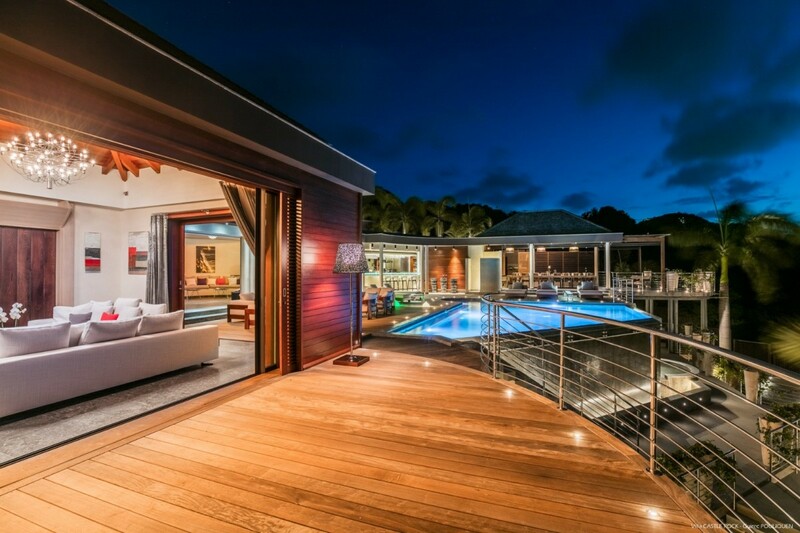 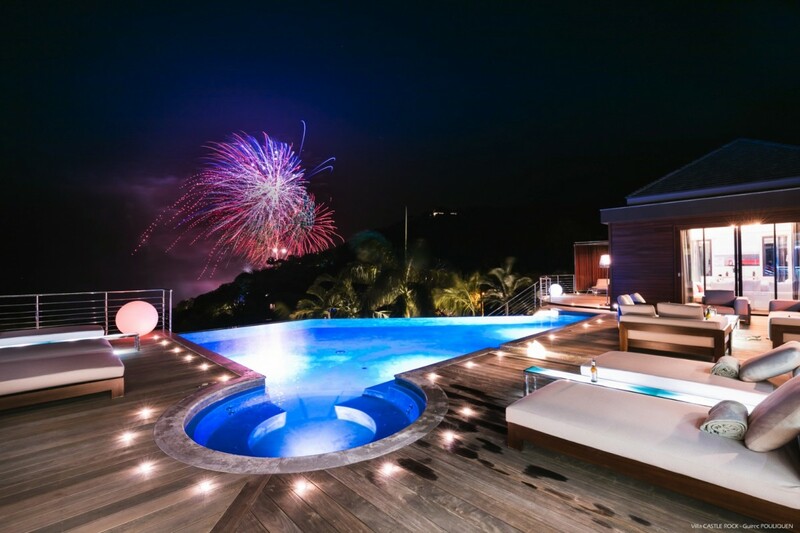 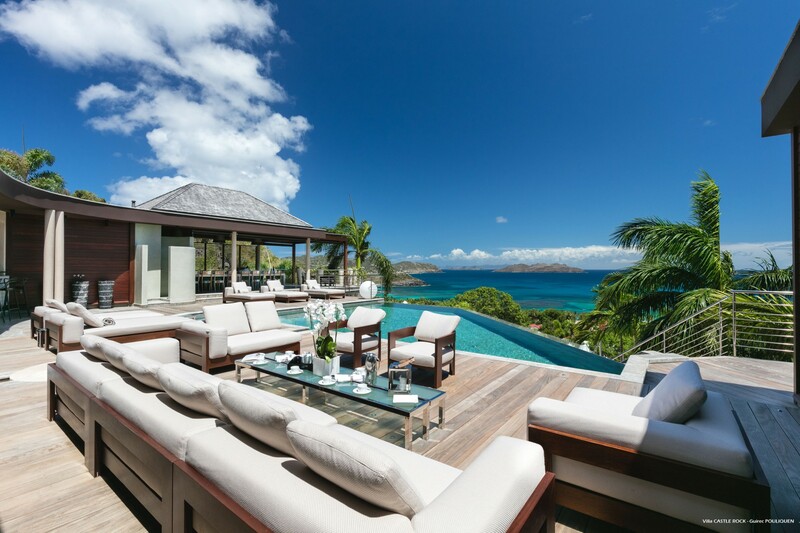 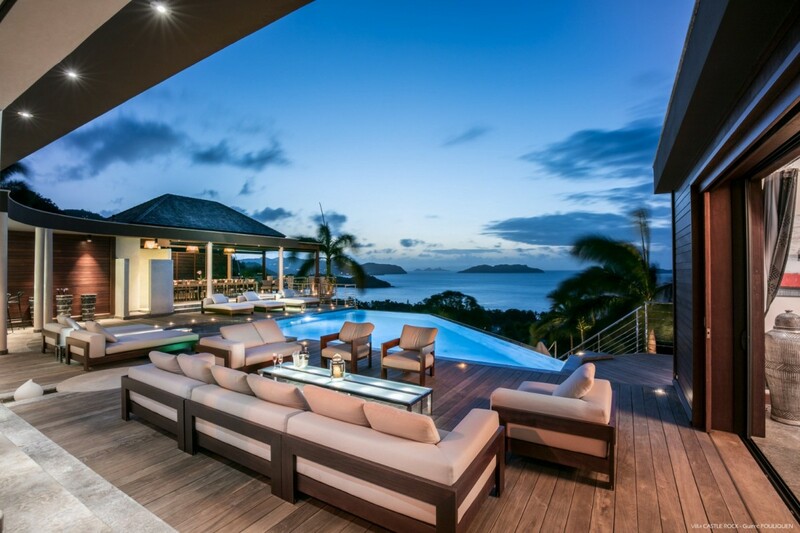 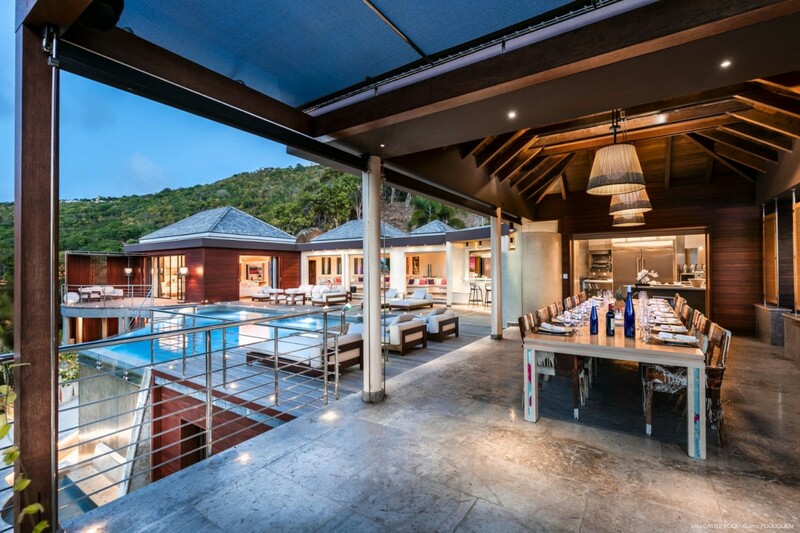 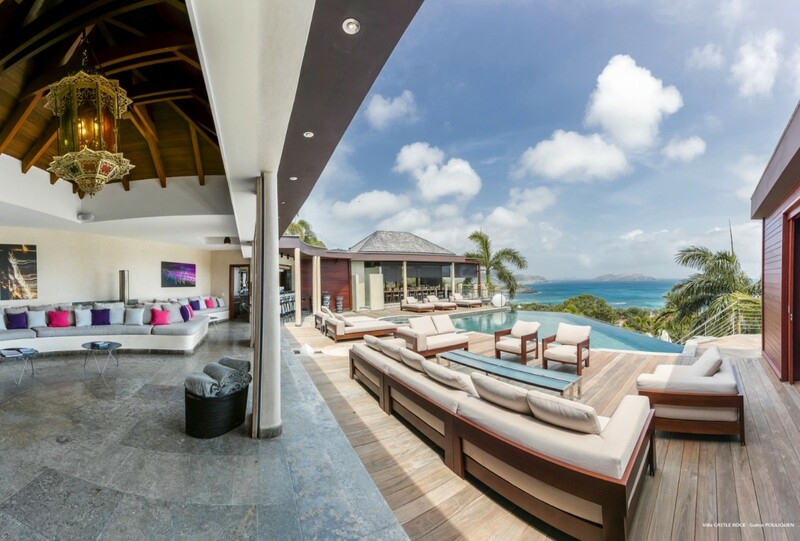 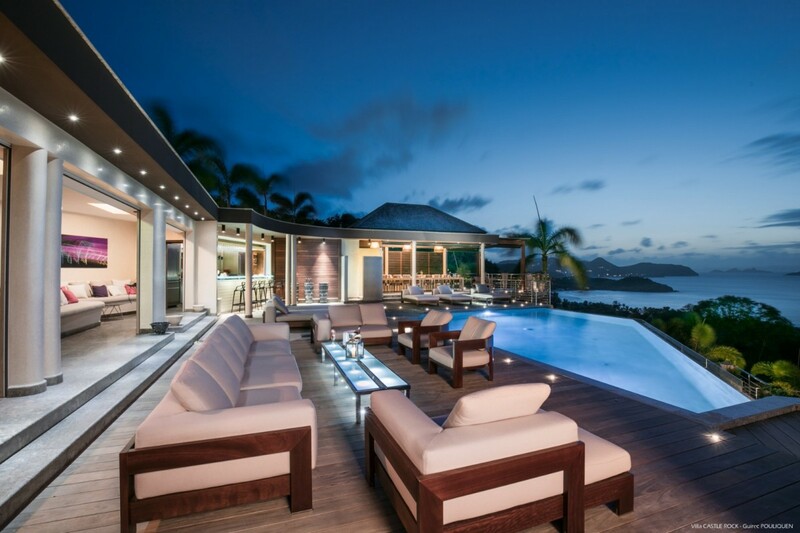 Villa Castle Rock, St Barts. 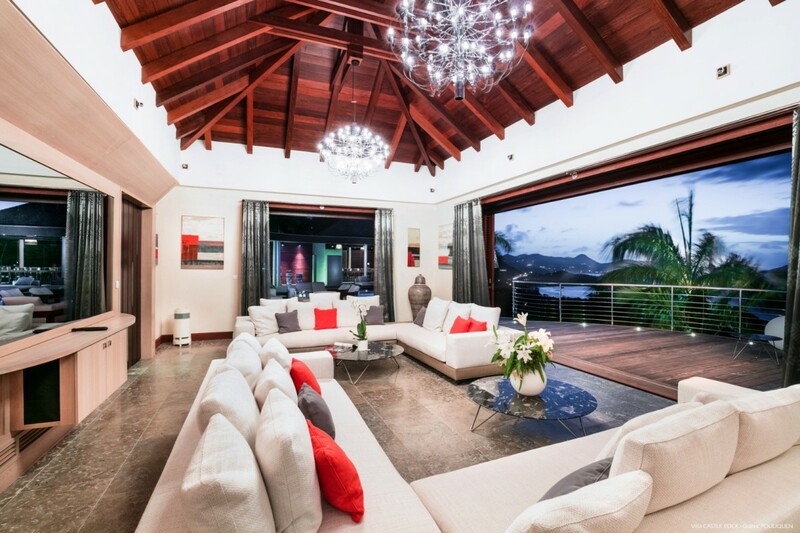 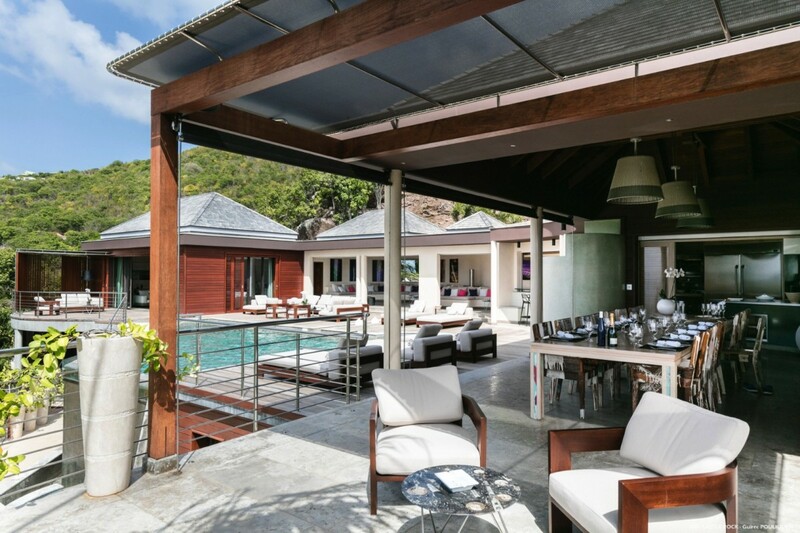 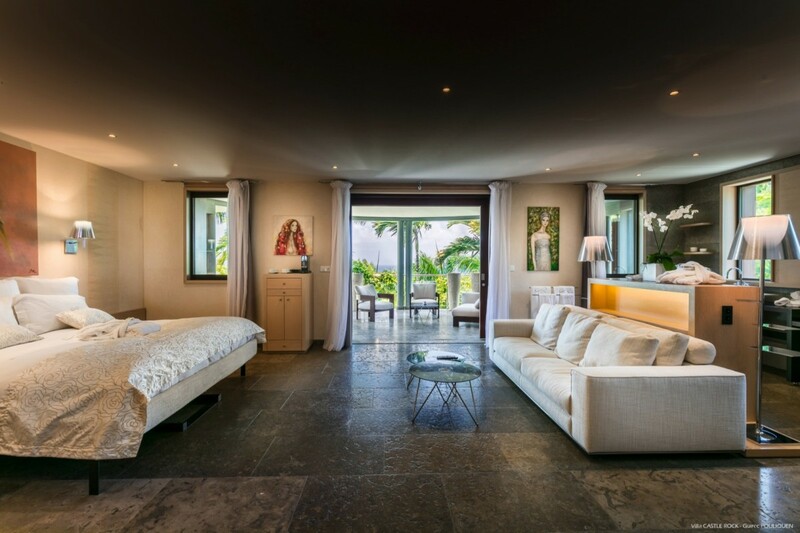 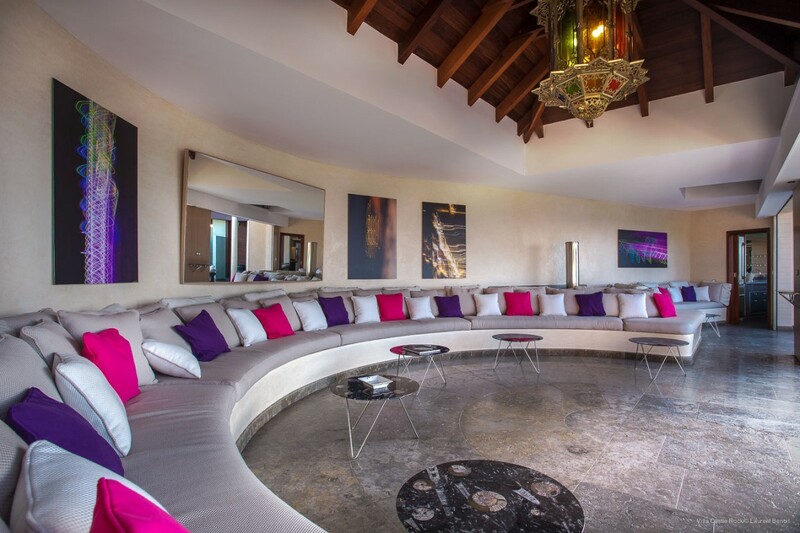 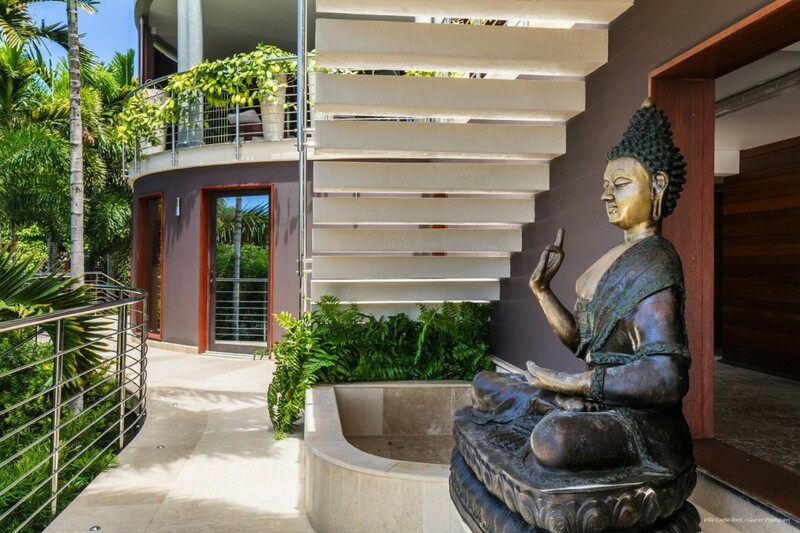 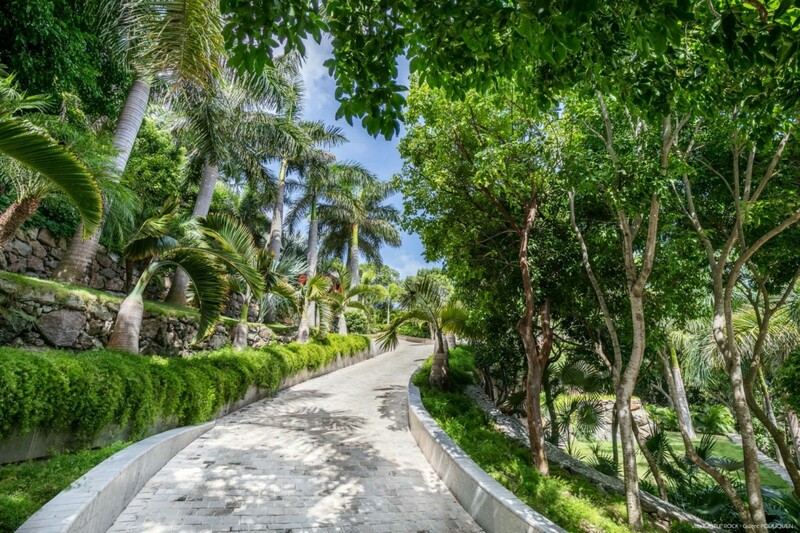 Set high in the scenic Camaruche area of St Barts, the five-bedroom Villa Castle Rock (aka Castel Rock) is an expansive and private estate-like retreat that offers a profound array of indoor and outdoor, shared and private living spaces - each a fantastic retreat or scenic delight. 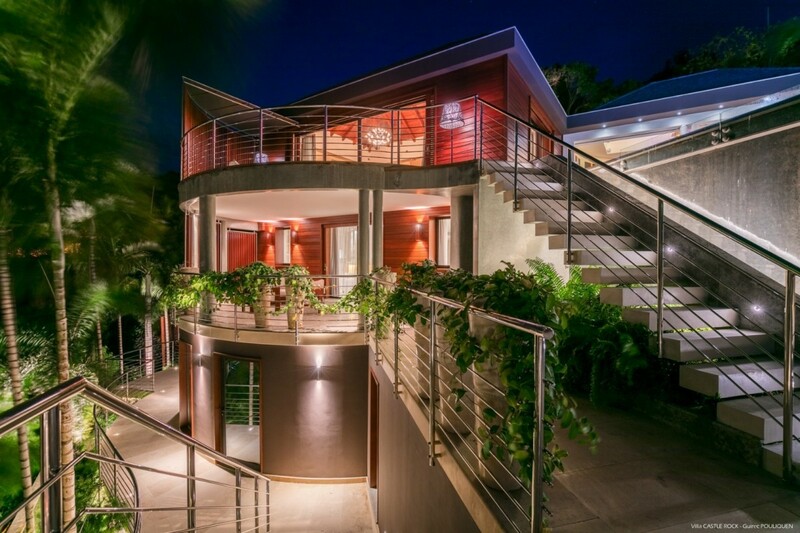 Built on multiple levels, and looking like a modern spin on classic castle design, it features turret-like structures, lots of natural materials, and appealing décor throughout. 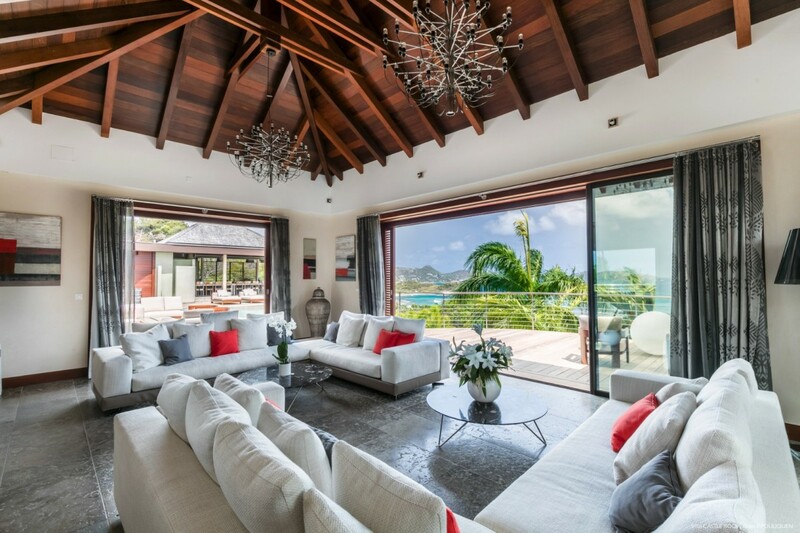 The interiors are a blend of classic island design with stone or wood floors, high wooden ceilings and enormous doors open to the views. 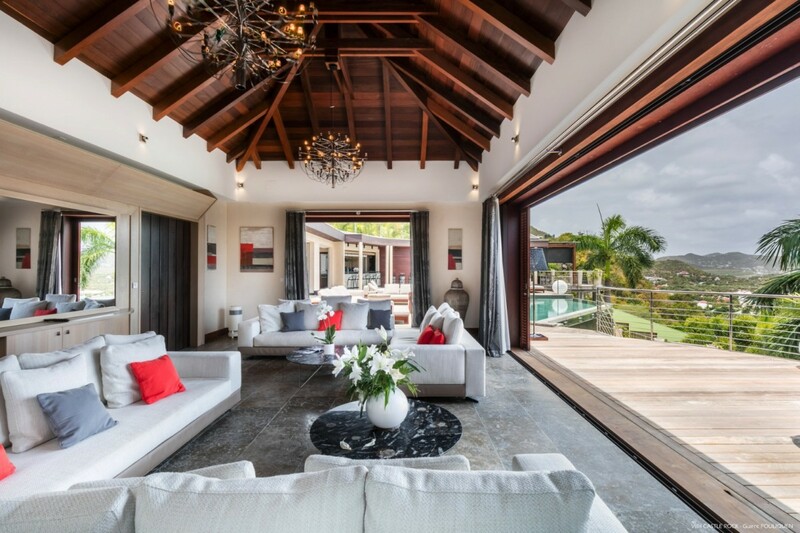 Yet, the décor owes a lot to the Asian and Middle Eastern influences that include oversized banquette sofas upholstered in luxurious textiles and roomy enough for enormous groups, charming glass lanterns, and soothing statues. 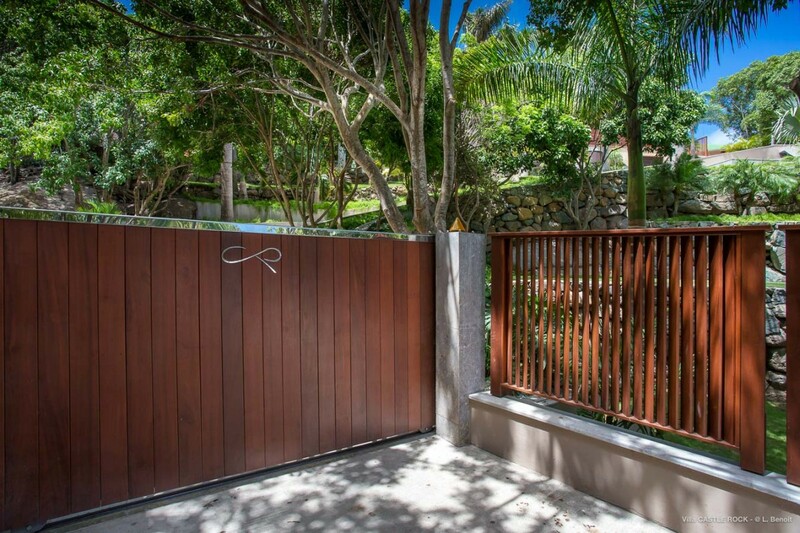 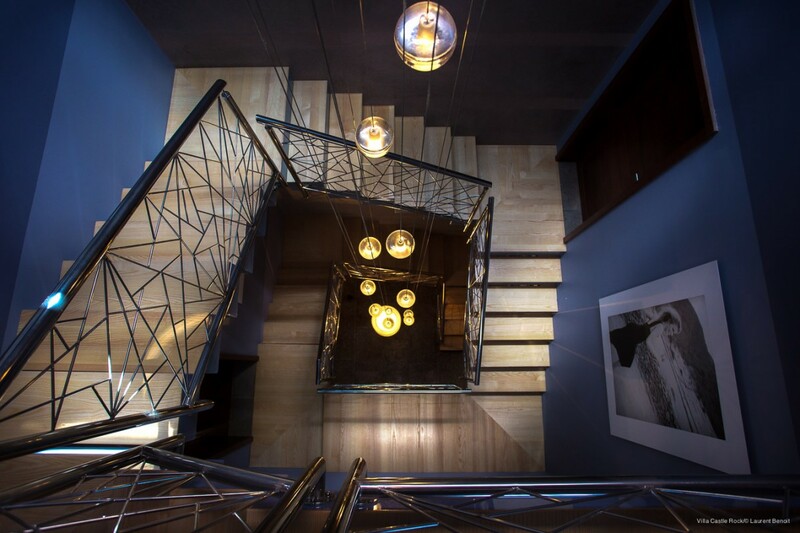 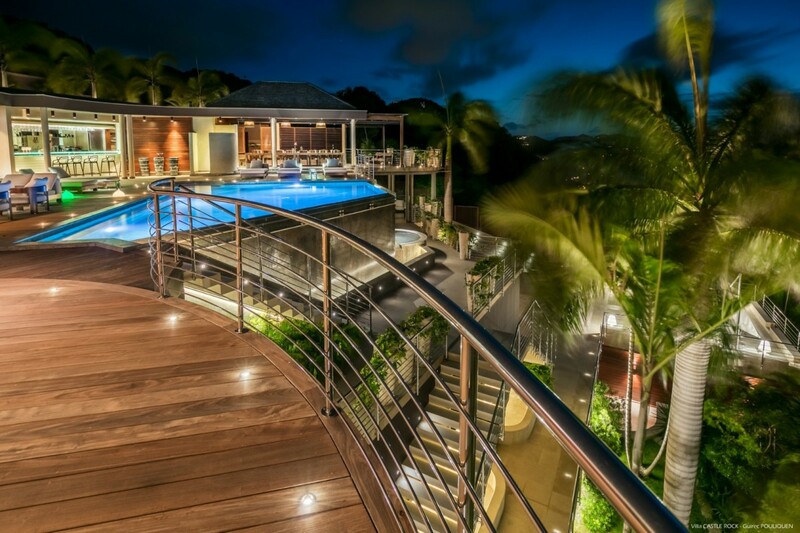 The shared living spaces include the upper level pool terrace with infinity-edge pool, fully furnished wooden pool deck, al fresco dining room, and massive living spaces inside. 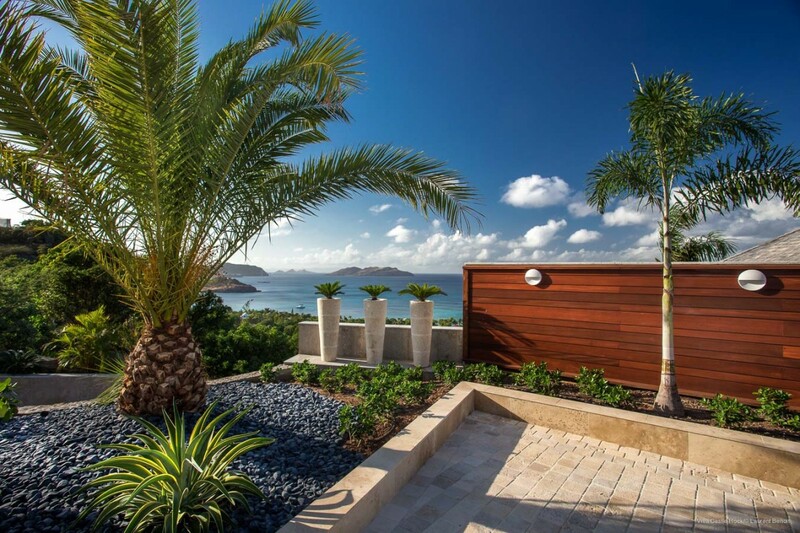 All of these areas face out towards the gorgeous views of the northeastern shore of the island. 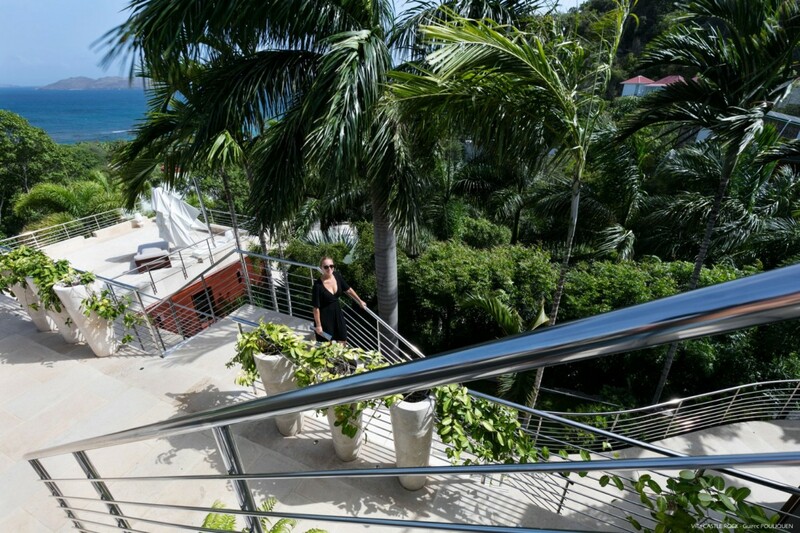 In addition to the pool, the shared living spaces include the enormous gardens, the bar area, fitness center, spa room, and the amazing range of terraces, patios and other outdoor spaces. 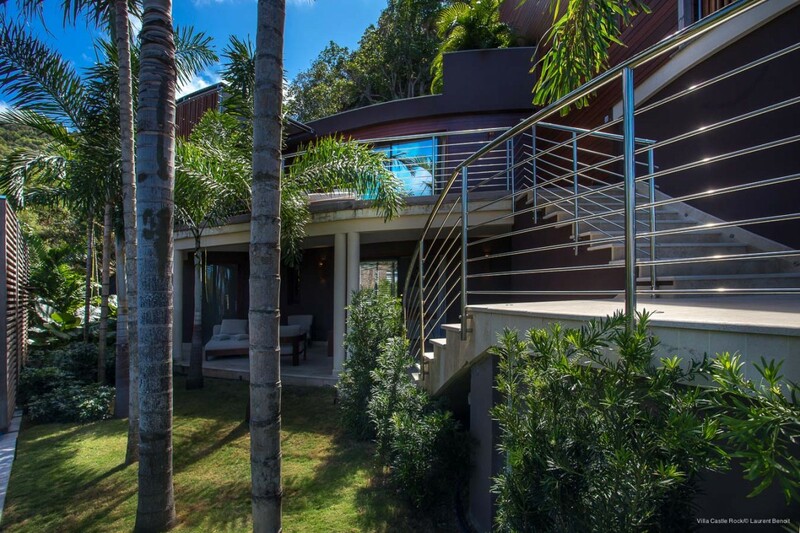 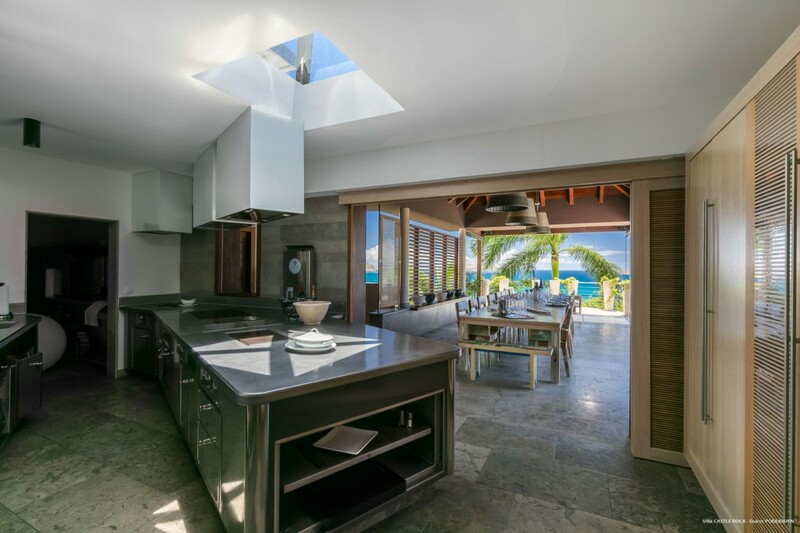 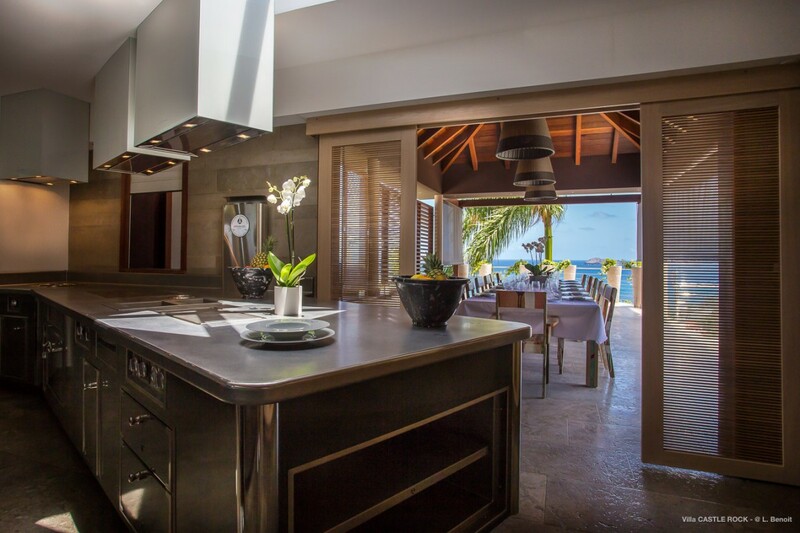 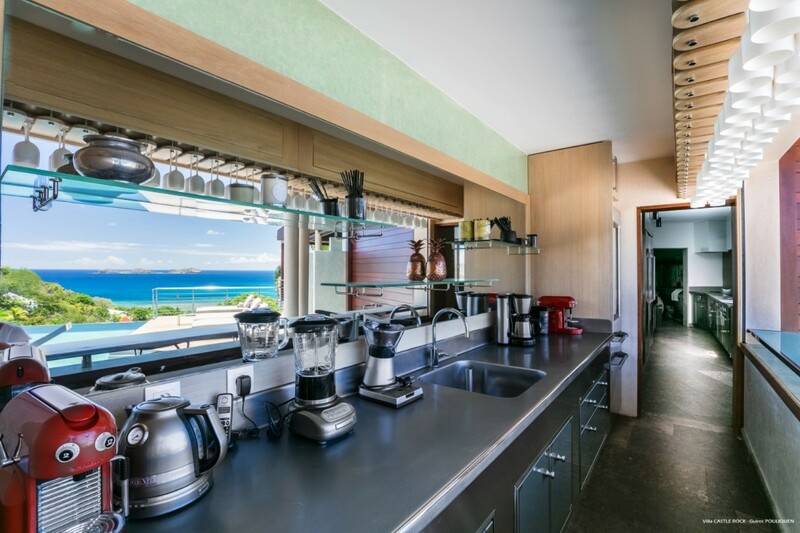 The main living level also features an enormous, modern kitchen that opens to the breakfast bar on the pool terrace, and the oversized entertainment room at a far end of the pool area. 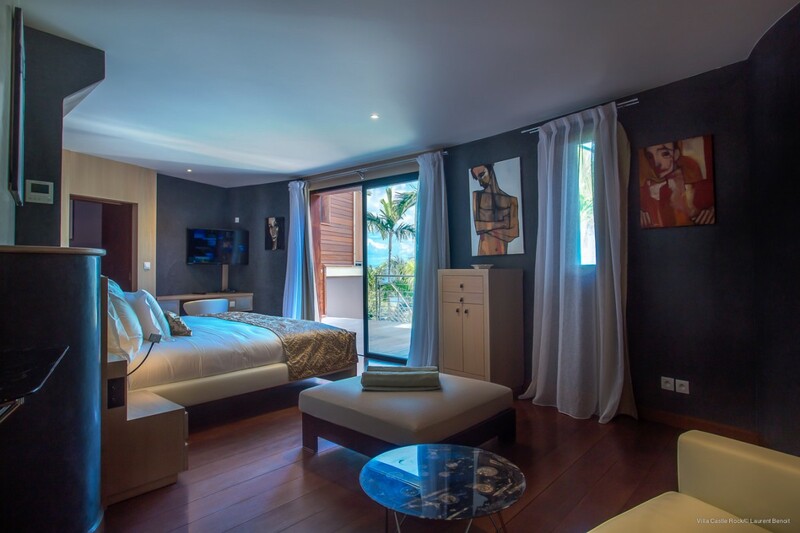 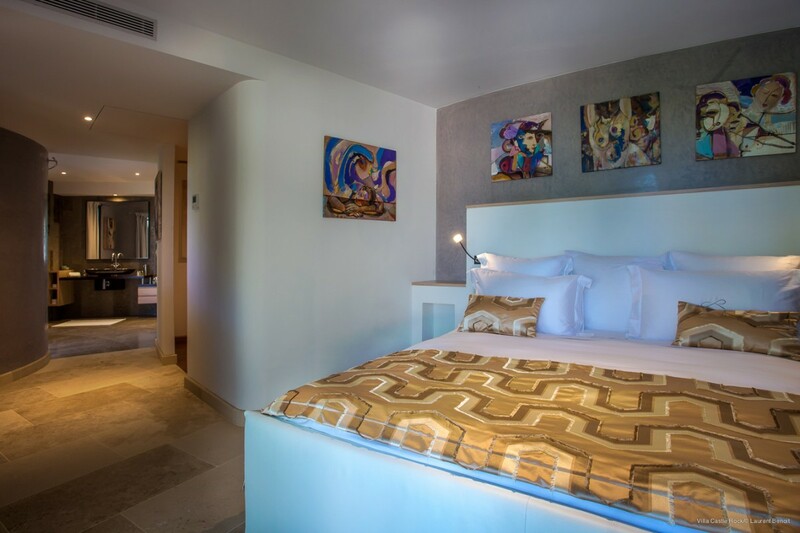 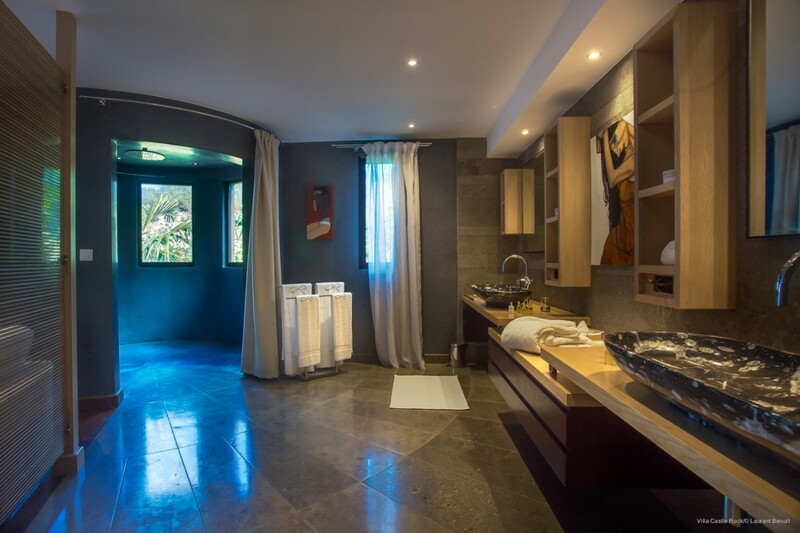 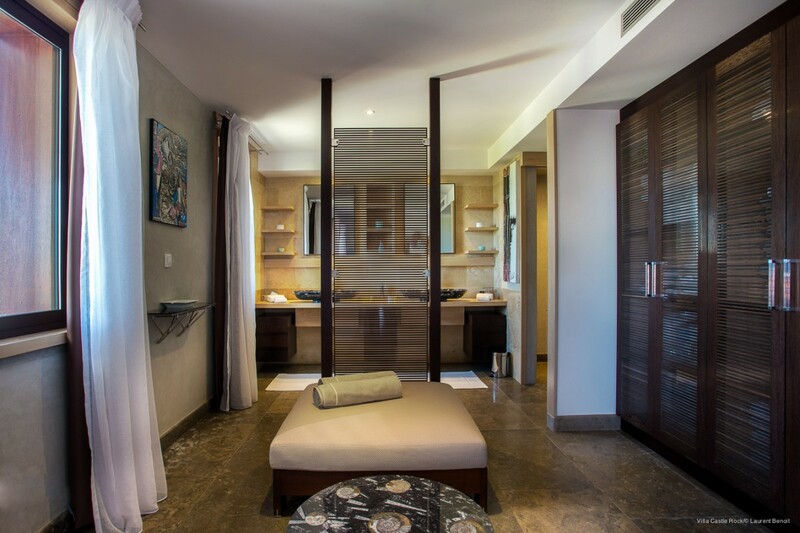 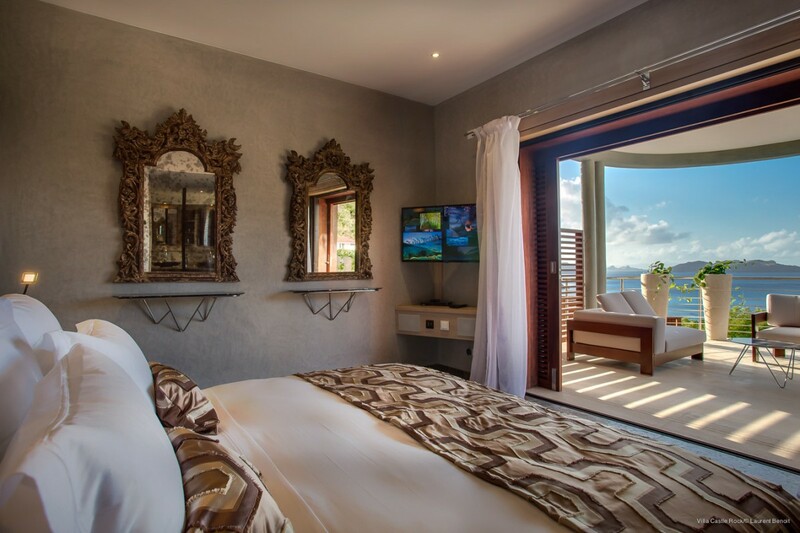 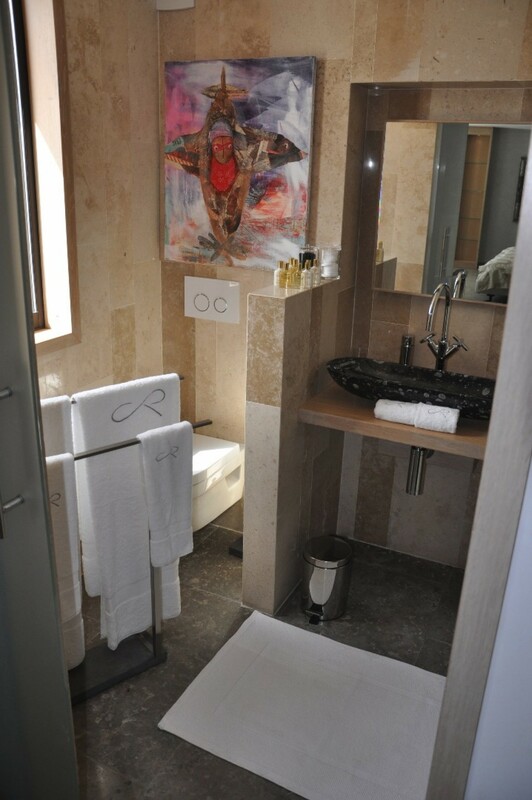 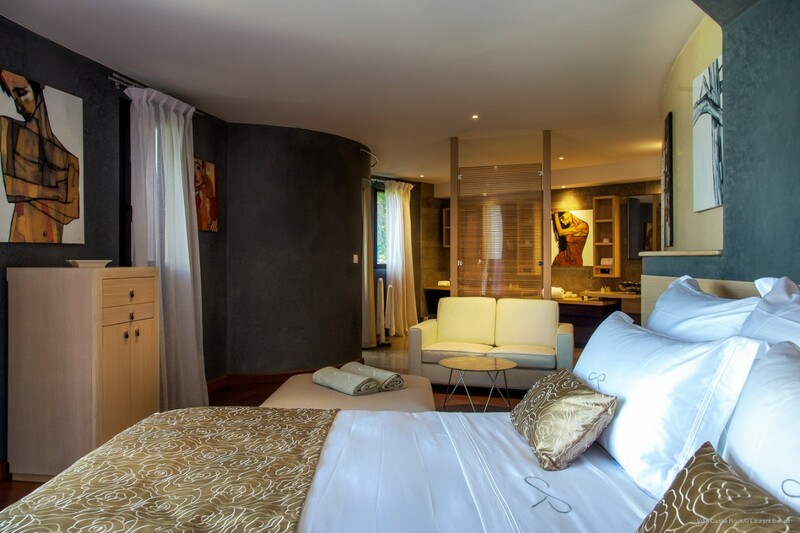 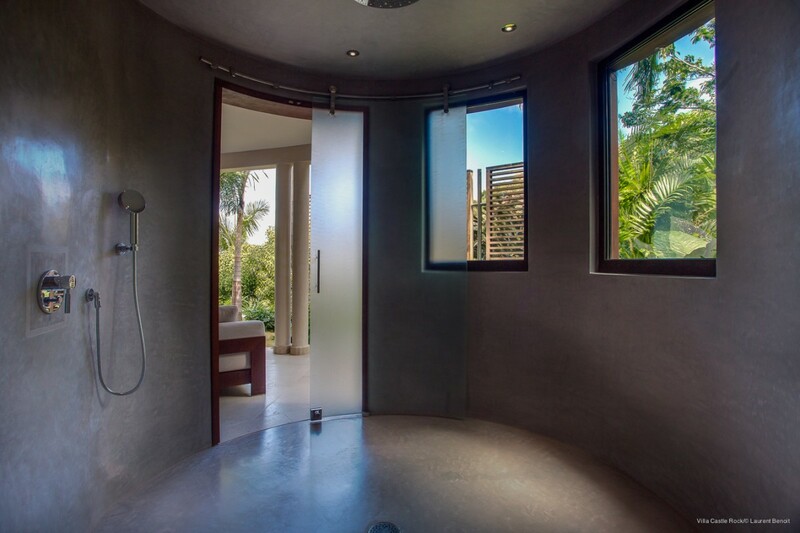 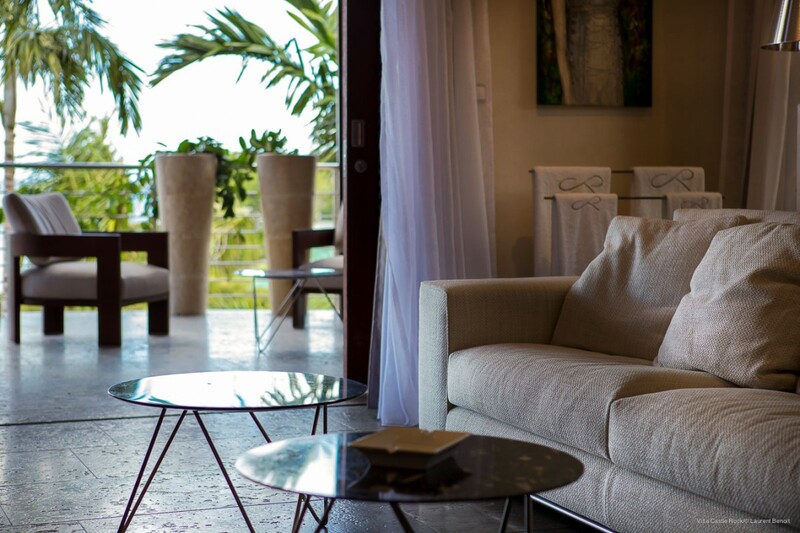 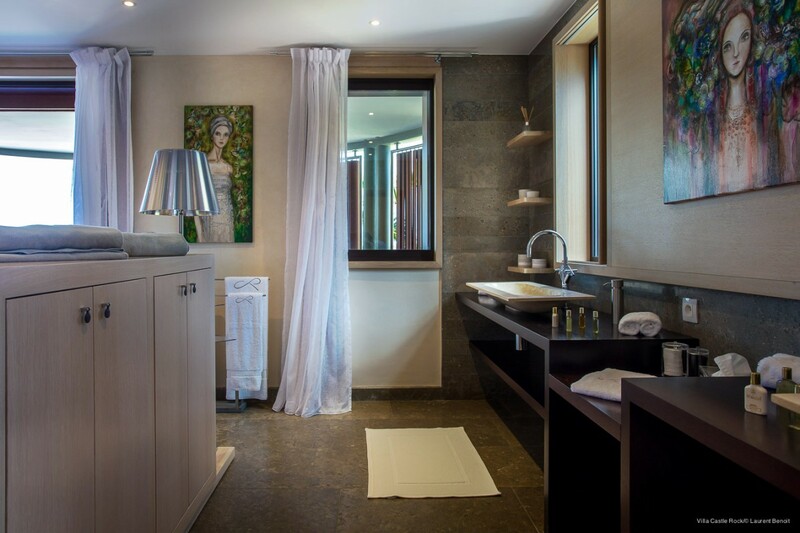 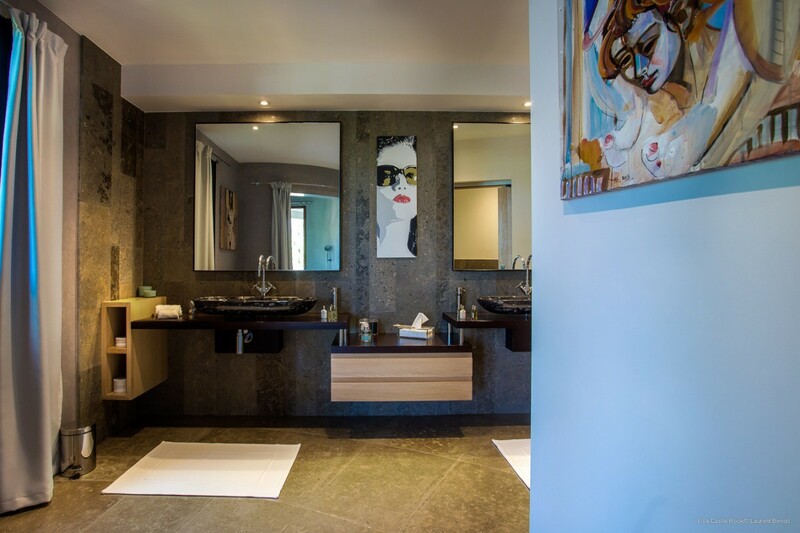 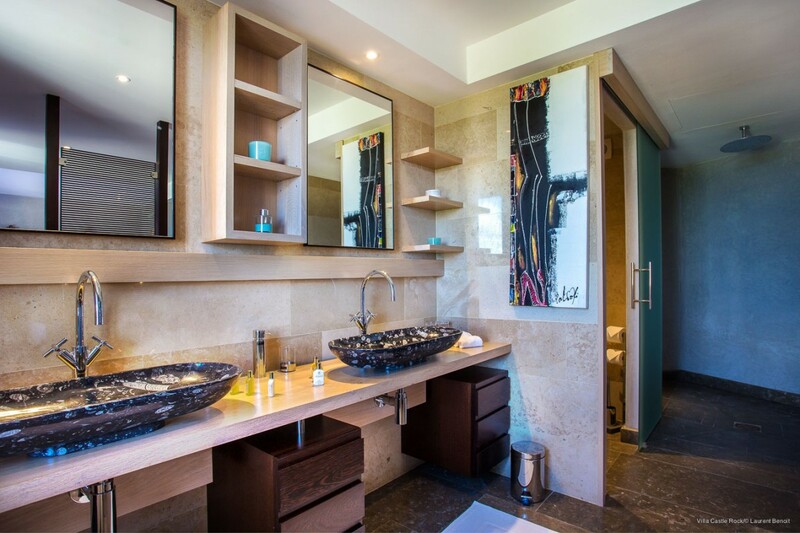 The bedrooms are amazing retreats of their own, each features a private bath, and four of the five have private terraces or direct terrace access. 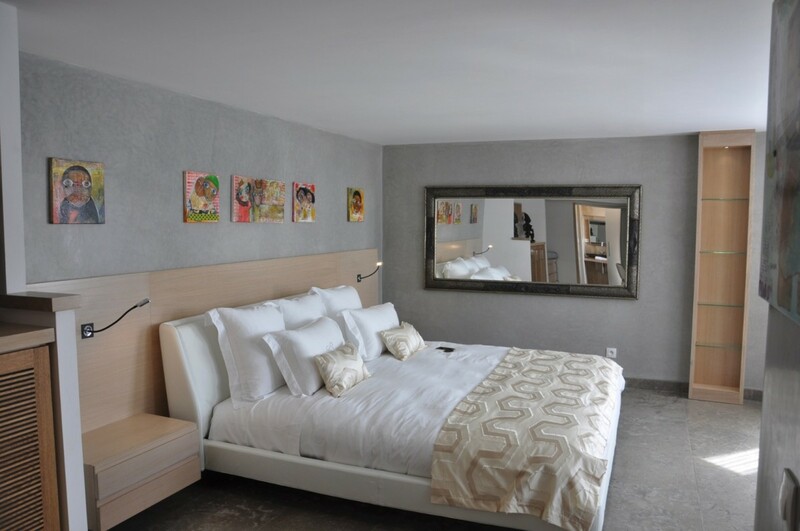 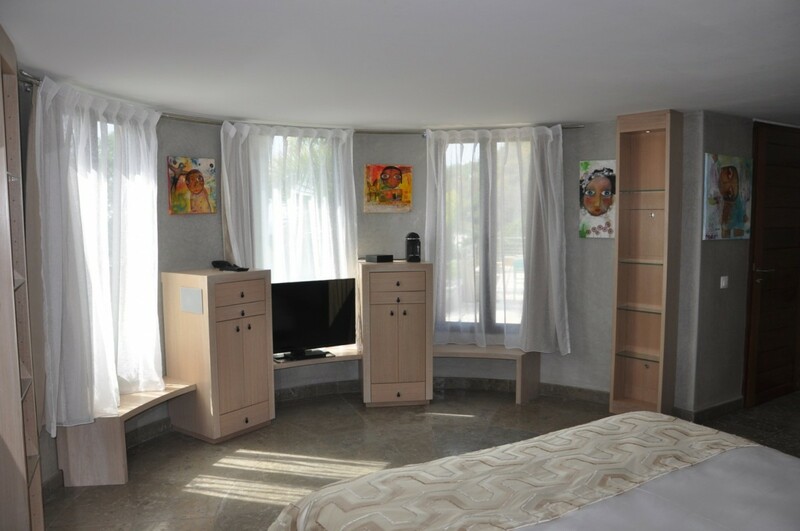 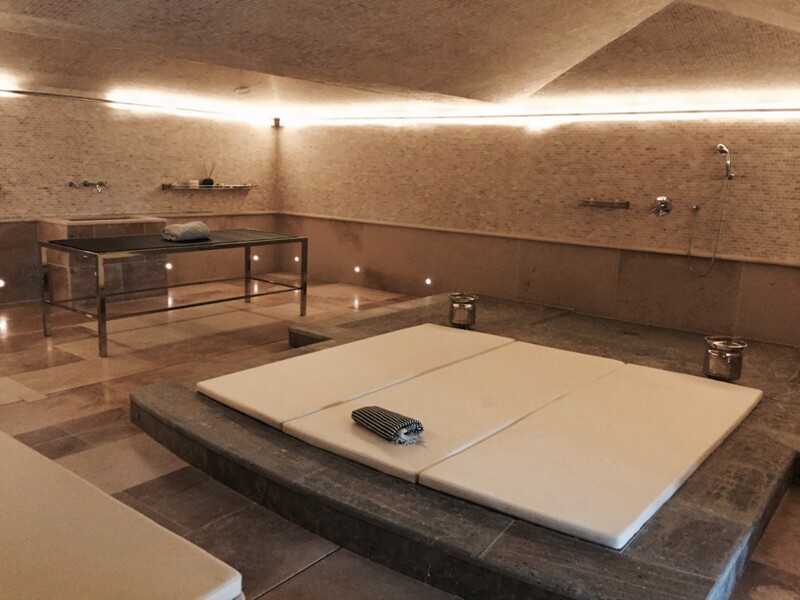 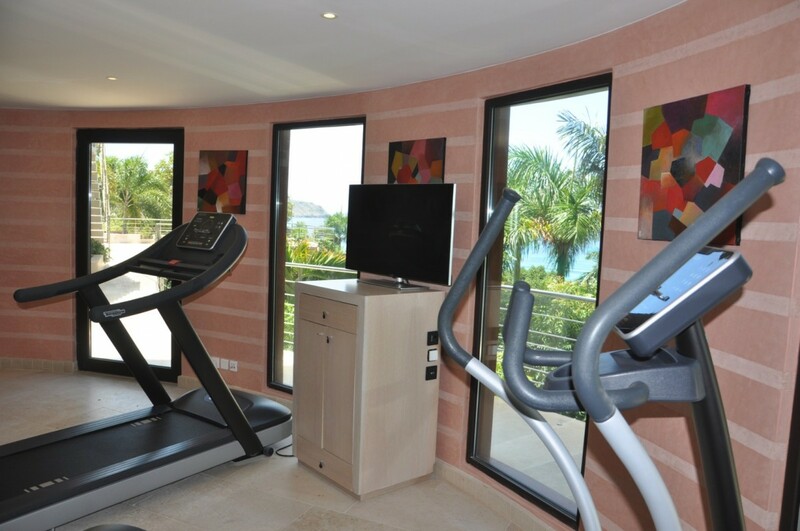 They are all equipped with premium entertainment systems, and feature king sized beds. 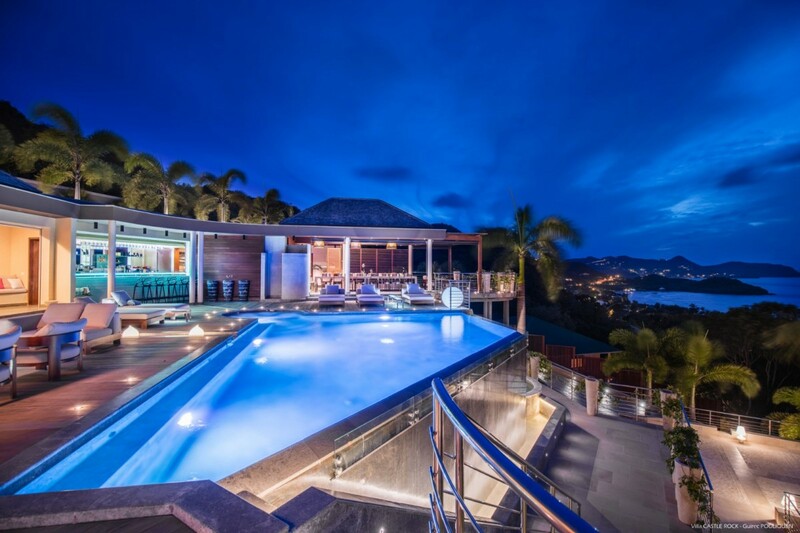 The Villa Castle Rock is a stunning find ideal for a large family gathering, a holiday with a group of discerning travelers, or an amazing space for a very small destination event. 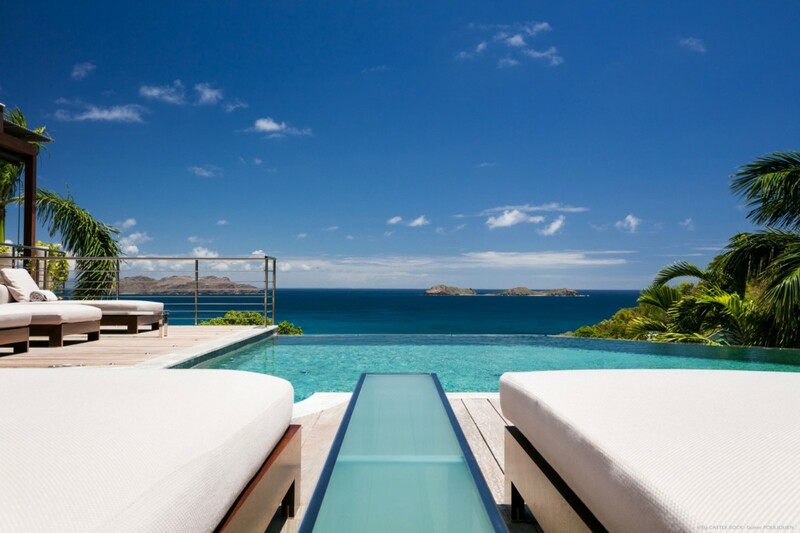 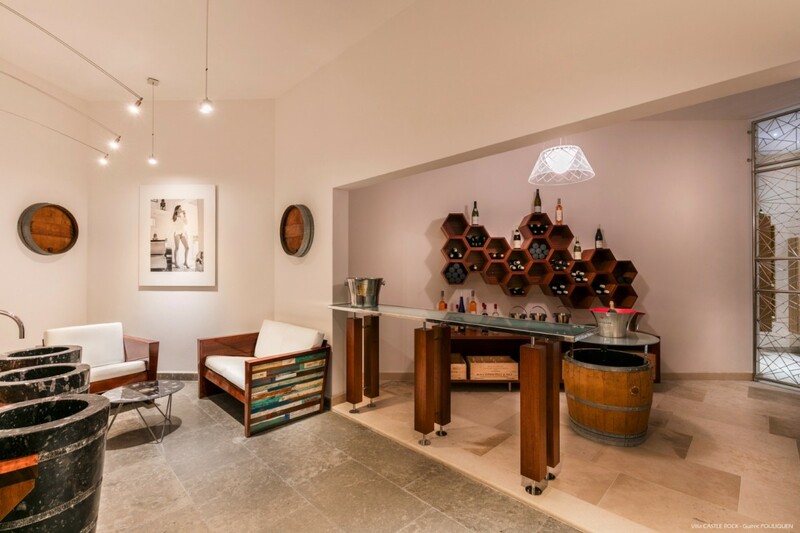 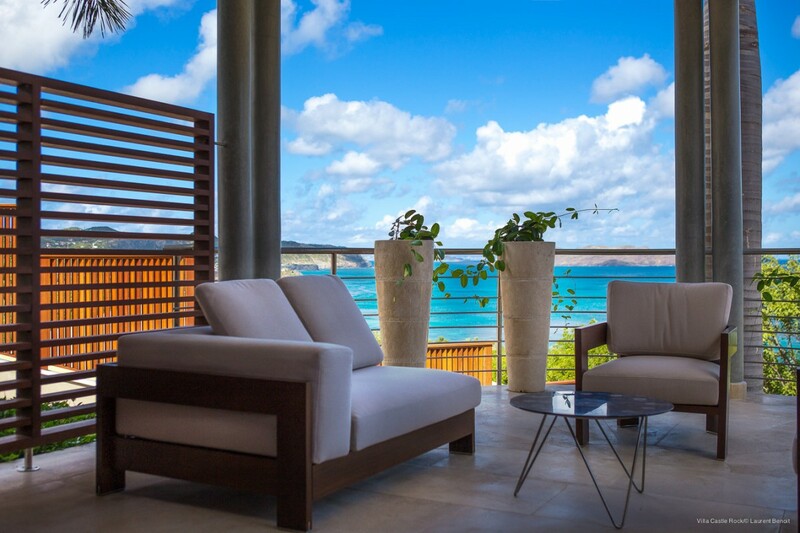 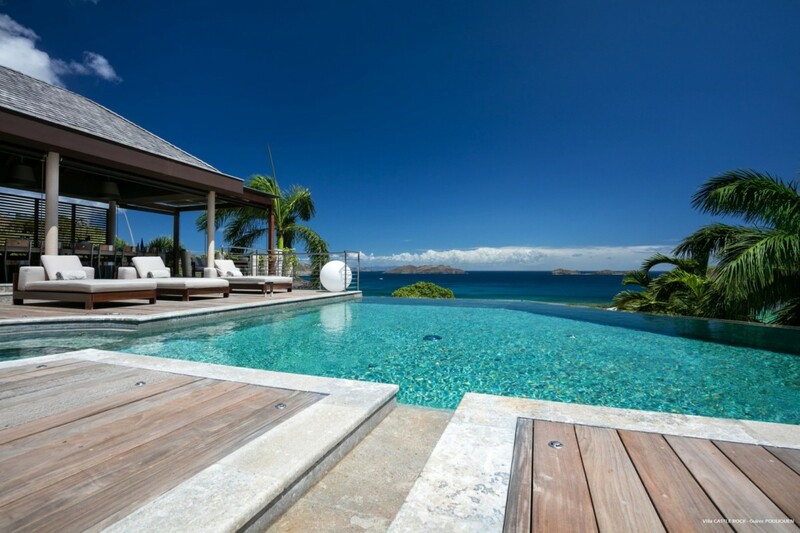 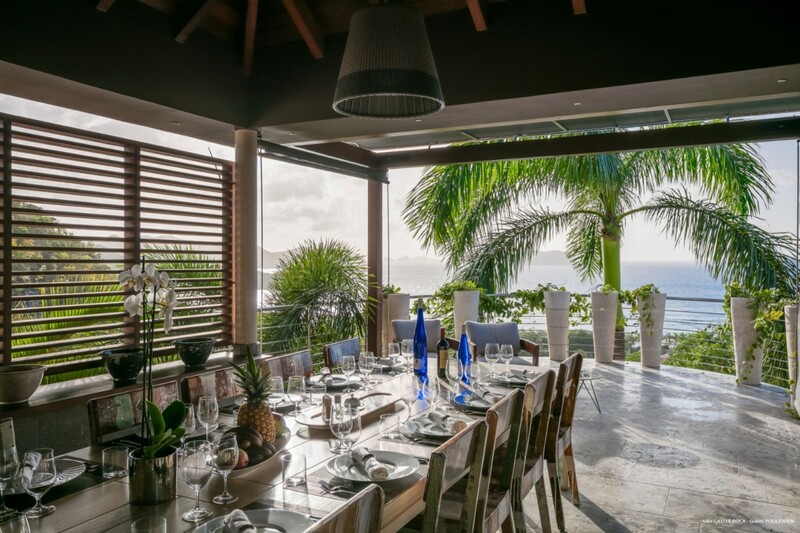 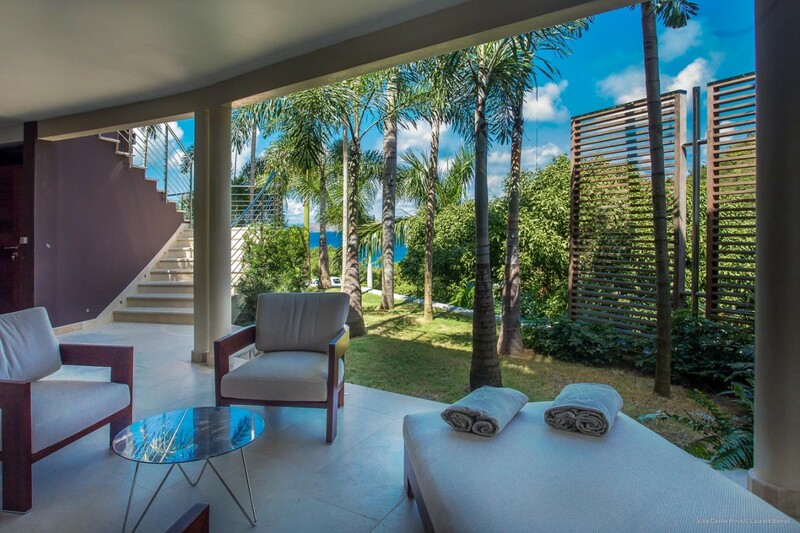 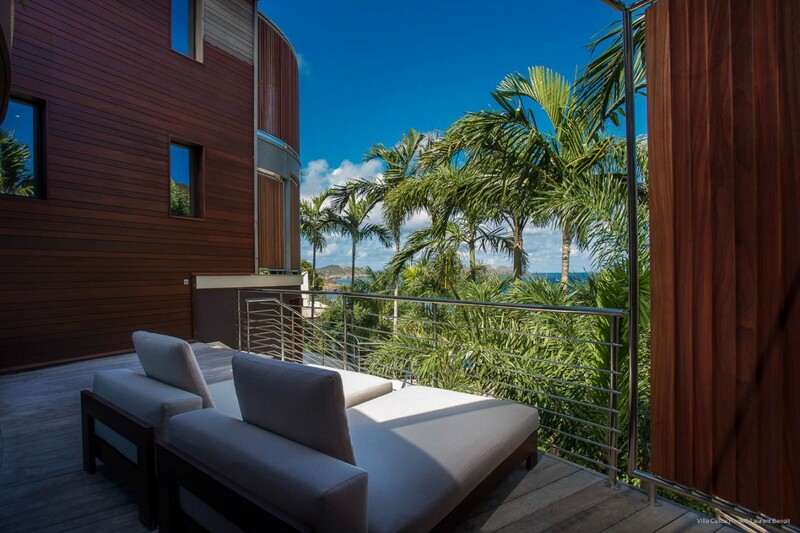 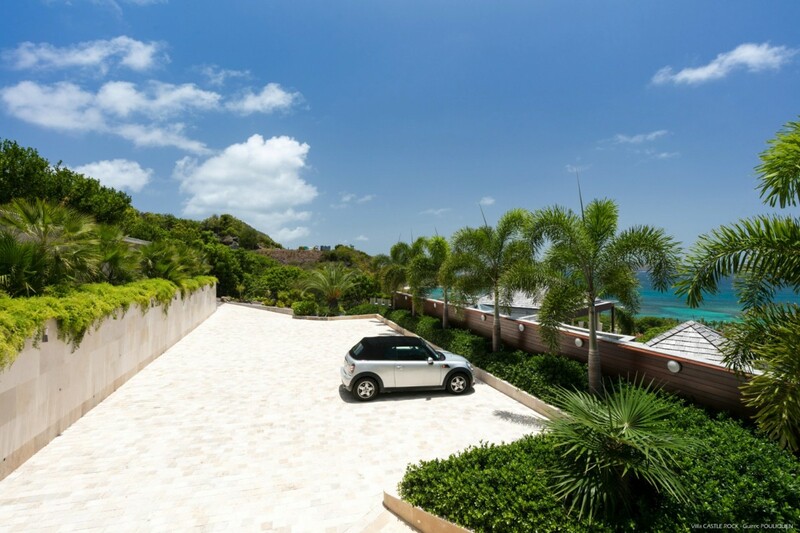 If you want to experience the best of St. Barts, this is the place to consider.